The diagram that we often see looks like this. Though it looks simple and persistent enough, it does not truly represent the change. 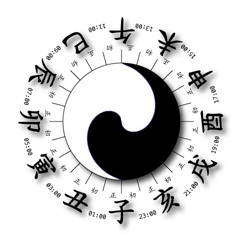 The most obvious change we can see from the diagram is that the Yin is diminishing while the Yang is enhancing, or vice versa. As such, they supposedly change in a proportionate manner and thus, there should be only one single occurrence when either of them reaching the most extreme. It is not the case in this diagram. Some even place a white dot in Yin and a black dot in Yang in order to emphasize the concept of “Yin in Yang” and “Yang in Yin”. Yin and Yang are not totally distinct but interact. 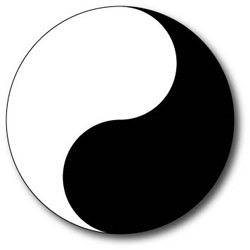 The true meaning of which in fact is to simply signify Yang starts to enhance while Yin totally diminished, or vice versa. The curve between the white and black illustrates just that. It would be unnecessary to overly emphasize this with the dots. The word Dao 道 literally means path, but in boarder term Dao 道 can also have the meaning of the ultimate law of nature, or philosophically the Way. Considering Metaphysics as an alternate study of our solar system, its change can be reflected as the daylight change in a day due to the rotation of Earth, or the seasonal change in a year due to the revolution of Earth around the Sun.